A task-driven workflow approach is used for instruments undergoing any type of installation, maintenance, recovery or repair. Workflows are assigned to all types of networked, autonomous, third party, and instruments based on ships or ROV. Instruments that require their data to be integrated into ONC archives follow the same workflow approach. ONC is constantly evolving and improving processes to ensure instruments are adequately maintained, producing good quality data and are easily accessible through the ONC data portal and web services. Workflow processes require all domains of expertise in the organization. The design and implementation of the ONC workflow system helps record events in the instrument life cycle, and tracks processes governing deployments, maintenance and recoveries. The addition of new instruments occurs through the acquisition phase. Instruments may be purchased by ONC, by a third-party or partner agency or even loaned from a partner organization or Principal Investigator (PI). The decision to add instruments to ONC observatories and archive is based on several factors including funding, advice from research scientists and through the assistance of ONC staff scientists. Many individuals with different types of expertise are involved in sourcing instruments and determining how to get them from the deck of a ship to the seafloor. In some cases the acquisition phase may only involve acquiring the instrument data, to be integrated into the ONC archive. The development phase of instruments includes software development, metadata integration, calibration, data product development and configuration of settings. Many teams at ONC work together to ensure that instruments are deployed with the appropriate set-up. In many cases, ONC works closely with PI and other partner organizations as instruments are developed for installation. The amount of effort during the development stage varies instrument to instrument. Some instruments are more complex and require more time for development, such as integrated camera systems, gliders and subsea crawlers. 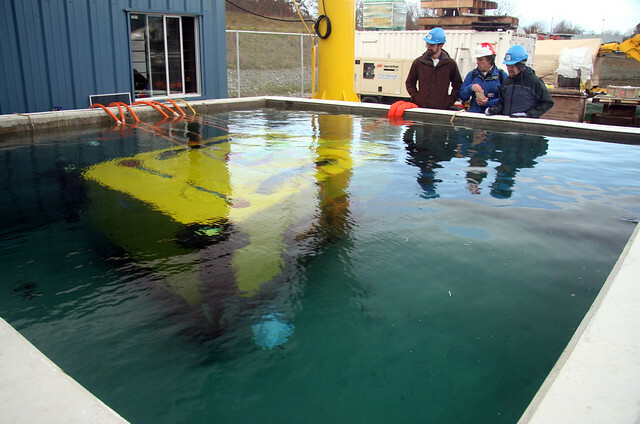 The development of instruments occurs at the Marine Technology Centre (MTC) and at the University of Victoria facilities. At MTC, a team of technicians, specialists and engineers work directly with instruments, cables and mounting hardware. At the University of Victoria, the software development team works on instrument data acquisition, archival, data product design, and data access. Instrument testing occurs at MTC. There are several types of instrument tests performed at ONC including dry bench tests, isolation tests in seawater, and final integration tests with instruments mounted on a complete instrument platform. The testing facilities at MTC have equipment such as submersion baths for individual instruments and a large test tank pool that can hold a complete instrument platform as it will be deployed. During the testing period in the tank it may be necessary to make adjustments so that the instrument responds as expected to all of the testing conditions. Instruments are tested with cables that will connect the instrument to the observatory, to verify that both the instrument and the cable are good. Housings are tested to ensure they are leak-free, able to sustain high pressures, and will not corrode in seawater. The ONC Data team at the University of Victoria must validate all test data prior to deployment, including data products and data access. Only instruments that pass testing will get installed on ONC observatories. This validation process is critical to ensure that instruments will operate optimally, and have the best chance to collect and deliver quality data. The Marine Operations team at ONC must carefully plan the deployment and recovery of instruments. The lift capacity of a winch on a ship, the ability for an ROV to grip an instrument platform, orientation of connector panels, tripod design, and acoustic release systems are some things that must be considered. Installation or recovery plans may include an individual instrument, a package of instruments, a stand or tripod, a large platform or even a node frame. Updates to instrument metadata must also be completed for any installation, maintenance or recovery. This includes recording geospatial metadata for instrument sites, recording instrument orientations, and ensuring that power settings on junction boxes are appropriate. Planning the deployment and recovery of cables is also very important. Cables can vary from a few meters up to 25 km in length. Long cable routes are mapped using Fledermaus and GIS softwares, and extensive dive plans are written to carry out challenging installations. The commissioning phase ensures instruments are collecting data, data are archived, metadata records are updated, and data are good. Data collection is verified in many ways depending on the instrument and type of installation. Some instruments collect data in near-real time, send data via iridium satellite, are acquired by File Transfer Protocol (FTP) or collect data autonomously using batteries. In many cases, data collection and archiving can be verified immediately after instruments are installed. Data from autonomous instruments must be collected upon recovery and added to the ONC archive. Metadata records are updated for each instrument during commissioning, including deployment times, instrument locations, and orientations on the seafloor. Data are commissioned by the ONC Data Team, using both manual and automated QA/QC procedures. The final removal of commissioning flags after instruments are deployed means that the data is deemed satisfactory.